Rose Ellen Nichols and Melody Courage star in Missing at City Opera Vancouver. Charles Barber was walking his beloved rescue dog Grendel through Vancouver's Downtown Eastside when he landed on the subject matter for his company's next opera. This part of town was experiencing an epidemic – still is – and he wanted to create a work of art to call attention to it. Four years later, Grendel has died, and the opera is about to have its world premiere. Missing, as the publicity material states, is a story everyone knows, about a woman no one remembers. It's a chamber opera, sung mostly in English, but also in Gitxsan. And it deals with the staggering losses of women and girls – missing and murdered – in Canada's Indigenous communities. "If 1,200 white women had gone missing, imagine what the response would have been," says Barber, artistic director of City Opera Vancouver and the driving force behind this commission. The actual number of missing and murdered Indigenous women, he adds, is surely far higher than official figures.
" Missing may be the most important work we have ever done," he says. "It is tragically timely, but [the issue] has been going on for years and there is no end in sight." As Barber attended rehearsals in Vancouver ahead of the opera's world premiere, the National Inquiry into Missing and Murdered Indigenous Women and Girls was hearing gutting testimony in Winnipeg. The inquiry itself continues to be controversial and is dealing with criticism and high-profile resignations. The opera, co-commissioned and co-produced with Pacific Opera Victoria, is set in the Downtown Eastside and along Highway 16, British Columbia's notorious Highway of Tears. Métis/Dene playwright Marie Clements wrote the libretto; Juno Award winner Brian Current composed the score. It is directed by Peter Hinton, who recently directed the Canadian Opera Company's remount of the 1967 opera Louis Riel.
" Riel was very much a piece about colonization," Hinton says. "And this opera is a look at what decolonization might look like. So while the subject matter is very serious and about grave injustice and tragedy, I find it very hopeful. because it's about the spirit finding home, it's about continuance, it's about the collision of culture." Left to right: Clarence Logan, Melody Courage and Rose Ellen Nichols. Clements, an award-winning actor, writer and director for theatre, film and radio, had not written an opera before. But when she was approached by Barber, she thought that opera could be an effective way to tell this story. "It's such a different form for me, but it's also connected to theatre and I think there's such an emotional quality to operas and kind of an epicness to it," she says, "and I really wanted to be able to kind of see what that was." A few months after receiving the commission, Clements was in Prince George, B.C., for her documentary The Road Forward (a film about First Nations activism) and was struck by the prevalence of the tragedy. "I didn't speak to one person who had not been somehow personally connected to it – whether they went to high school with someone or whether they knew parents of someone or whether they were directly affected. When we read the newspaper [or] we see it on the news, it can feel like it's [happening to] somebody else. But it's really close to a lot of people," she says. "That's shocking that it's just so present." Current wrote the music over an accelerated period in his basement at home, with photos of missing women and mothers of missing women propped up on his piano – "just to remember that this is not just any old piece or any old commission. This is a tragedy that is not fiction," he says, pointing out that in the time he was writing, four Indigenous women were murdered in Winnipeg and two went missing in Ontario. "There's such a strong sense of mission about this piece," says Current, who is not Indigenous. "It's just kind of unbelievable that this is happening right in our backyard." To turn mission into music, Current employed a musical language that is more direct and less opaque than is typical for him, with major and minor chords. "Because I don't want people to have to listen to it six times to get it. I want people to get it right away. I want it to have impact the first time they see it." At rehearsal earlier this month, Hinton watched carefully as Melody Courage and Caitlin Wood sang a key scene together, under the guidance of conductor Timothy Long, who is native American, of Muscogee Creek and Choctaw descent. 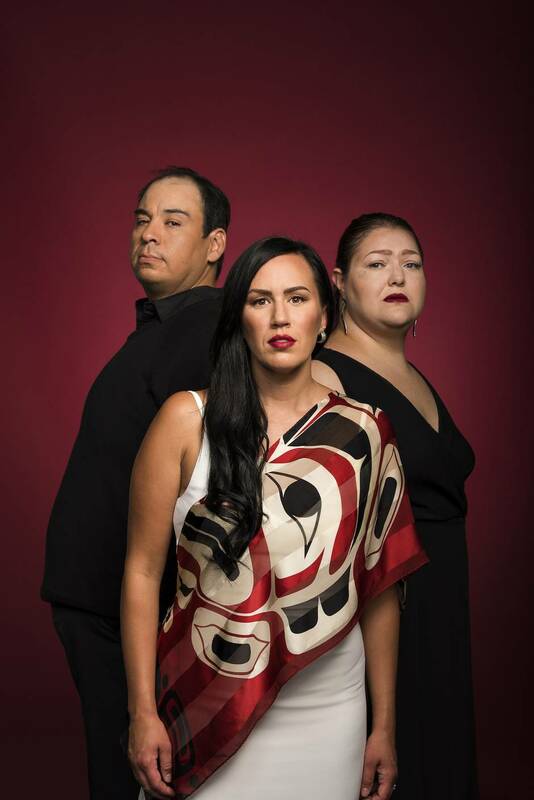 The opera, co-commissioned and co-produced with Pacific Opera Victoria, is set in the Downtown Eastside and along Highway 16, British Columbia’s notorious Highway of Tears. Courage, who is Métis, plays the unnamed First Nations girl. Wood plays Ava, the white girl. Courage initially thought she would be unable to play the role because of other commitments, but after speaking to Barber about the project, she found a way. "I just remember being in tears and being like: I have to be part of spreading this message," she says. "Because it hasn't gotten the attention that it needs." Some of the opera is sung in Gitxsan – with translations by native speaker Vincent Gogag, who was also diction coach. It's a guttural endeavour, speaking Gitxsan, which Gogag has described as talking as if you have a fishbone in your throat. This has been challenging – but also rewarding. "I feel really grateful that I'm able to be in a show where I'm able to hear and then sing this beautiful language," Wood says. "Because a big thing in colonization is that their language was taken away, so being able to hear this language is really special." Grief counsellors will be at each performance. Two days before the opera's world premiere, a free, invitation-only private performance will be held for family and friends of missing and murdered Indigenous women. The creative team understands what an emotional night that will inevitably be. "When you do opera, even if the storyline is difficult, generally it's from the 1700s and somebody died or somebody lost their lover. But you're never in the same space as someone who has had such a tragedy," Wood says. "Wanting to serve this story with respect for them and for these families is difficult and is a big responsibility. And as someone who's Caucasian, I feel grateful that I'm a part of this story. "I know on that night I'll probably cry and cry and cry after the show," she continues. "Because I can't even imagine losing a daughter or a sister or a mother in this way. I think it's really brave for the people who are going to come." Missing is at the York Theatre in Vancouver Nov. 3-11 and at the Baumann Centre for Pacific Opera Victoria Nov. 17-26. A 2018 tour is being planned along the Highway of Tears (cityoperavancouver.com; pov.bc.ca).